NEWS: SSWP meeting at APA Eastern Division Conference, members presenting at APA; Philosophy A-levels; Brazil conference, Paderborn conference, forthcoming conferences. Reminders: Amazon Smile, Reminder: Complete your Bios; Pay your 2016 Dues!! 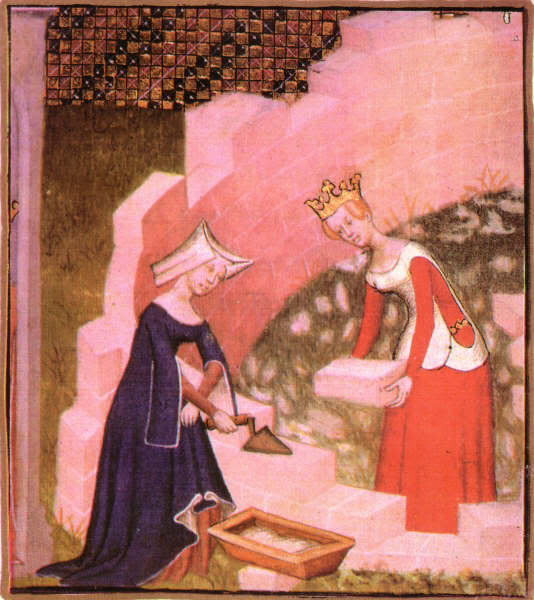 Left: Christine de Pizan. Illustration from her City of Ladies. SSWP at APA: DVD Volume 2 Preview!! The Eastern Division of the American Philosophical Association will meet January 6-9th at the Marriott Wardman Hotel in Washington, DC. SSWP will hold an open forum for discussion on Expanding the Canon. That forum is scheduled for Saturday, 9 January from 9 a.m. to 11 a.m. and will open with a preview of two women philosophers featured on the 2nd Volume of the Busted!! DVD. Look for posters in the Registration area and throughout the conference areas. New memberships will be accepted (PayPal, credit card, check) at the conclusion of the forum. The forum will be followed by a business lunch meeting to occur at the Marriott's restaurant. The meeting is open to all members. Members of the Board, please plan to attend. If you plan to attend the business meeting, kindly email Mary Ellen Waithe at SSWPdues@gmail.com so I can reserve an appropriate size table. SSWP Member Laura Weed of the College of St. Rose, will chair a session at the International Institute for Field Being on Friday 8 January from 11:15 - 1:15 at which SSWP Member Melanie Johnson-Moxley of Columbia College will present Friday 8 January "A Whitheadean Assessment of Disruption." Progress comes in little bits: in England, preparation for university studies occurs at the "college" (in US: High School) level where students may take "A-level" (advanced level) coursework considered to be essential preparation for university. The British Philosophical Association had raised concerns about the absence of women in the A-level philosophy course content. I have not been able to track down the exact details, but it appears that philosophical works by at least two women will now be included in each philosophy course so that students will understand that women have always been engaged in philosophy. Moreover. the preparatory colleges will have opportunities to consider feminist issues related to the history of philosophy and to examine why women philosophers are less well-known than their male counterparts. The curriculum will also expose students to contemporary works by influential women philosophers. The Universidade Federal de Uberlândiais is located between Brasilia and Sao Paolo. Last month it hosted an International Colloquium at its Santa Monica Campus: Women in Philosophy 23 November 27, 2015. There were also several Round Tables. One was a discussion featuring host university scholars Carlos Gonzales who presented "The thought of Julia Kristeva;" Fabio Nascimento who spoke on "Susan Haack - mediation between scientism and anti-scientific attitudes, "and Diego Avedagno whose presentation was "The theoretical overview of GEM Anscombe: exposition of philosophical development of a British thinker." A second Round Table featured Fernanda Miguens of the Federal University of Rio de Janiero: "The evening gender: considering the woman in Sufism; " Luciene Torino and Suellen Teixeira, both of the host university, each gave a presentation on Defining. Alexandre Guimarães of the host institution spoke on Elisabeth of Bohemia and the mind-body interaction problem; Wojciech Starzyński from the Polish Academy of Sciences, gave a a presentation on WW II - era Polish philosopher Irena Krońska and her philosophical life as seen from her correspondence with Czech philosopher Jan Patočka. Another session featuredAndré Duarte of the Federal University of Parana, speaking on“ Judith Butler and Hannah Arendt in dialogue: rethinking ethics and politics,” followed by Alcino Eduardo Bonella of the host institution exploring the subject of Women and Rationality. In an evening session, Alejandra Ciriza of the National University of Cuyo Argentina, offered a paper Women in Philosophy: Reflections from the South. At the same session, Francesca Izzo of the Eastern University of Naples, Italy presented a paper on the philosophical roots of feminist culture as opposed to the liberation of gender. The conference concluded with the film Àgora, on the life of Hypatia of Alexandria It is extremely heartening to realize that scholarly work on women in the history of philosophy has spread as far as central Brazil. To our colleagues there, we offer congratulations for such a diverse and substantive conference, and a heart-felt Bem-vindo à pesquisa sobre as contribuições das mulheres na filosofia! The University of Paderborn, Germany, under the direction of SSWP member Ruth Hagengruber held a conference Emilie du Chatelet: Laws of Nature / Laws of Morals. The two day conference met October 23rd & 24th, 2015. Andreas Blank of the host university presented "Metaphilosophy and the Principle of Contradiction: Leibniz, Wolff, Châtelet," Gábor Boros from Eötvös -Loránd-University, Budapest, Hungary, spoke on Leibniz's Metaphysics of habitudo in and around his "quid sit" idea. A joint presentation by Luka Boršić and Ivana Skuhala Karasman from the Institute of Philosophy in Zageb, Croatia on "Emilie du Châtelet and Josip Ruđer Bošković" was followed by SSWP member and conference organizer Ruth Hagengruber on "Laws of Nature – Laws of Morals." Dagmar Pichová of Masaryk University, Brno, Czech Republic gave a paper "Du Châtelet and Mairan: Arguments and Fallacies," followed by a presentation "About the Interplay between Regulative Principles and Working Hypotheses: A Comparison between Du Châtelet, Laplace and Somerville," given by Andrea Reichenberger of Ruhr University, Bochum, Germany. Doctoral Candidate at the host university, Ana Rodrigues spoke on "Du Châtelet’s and La Mettrie’s Debate on Determinism." Her presentation was followed by Dieter Suisky of Humboldt University, Berlin, "Emilie Du Châtelet’s claim for impartiality as a prerequisite for the reception of Leibniz and Newton." 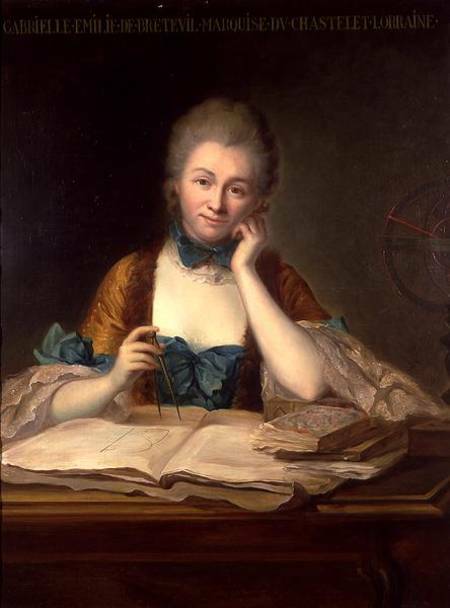 Kudos to Ruth Hagengruber for crafting a conference focused on a single woman philosopher, but covering such a wide array of topics, thus demonstrating the breadth of Emilie du Chatelet's genius. 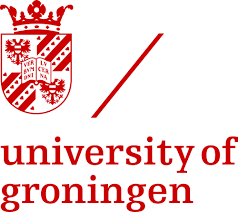 Conference Announcement: The University of Groningen, Netherlands will sponsor a conference Early Modern Women on Metaphysics, Religion and Science, 21-23 March, 2016. Confirmed invited speakers include SSWP members Jacqueline Broad and Ruth Hagengruber. Conference Announcement: University of Paderborn, Germany under the direction of SSWP member Ruth Hagengruber will sponsor a conference Women Phenomenologists on Social Ontology, February 11-12, 2016. About a year ago SSWP member Nancy Tomaselli came across information about the work SSWP members have done with regards to women philosophers. Nancy is a retired RN, a Health Care Administrator and a Licensed Nursing Home Administrator in Florida. She reports feeling overwhelmed with the impact this work will have on women's place in society. She has read seven philosophy books including Waithe’s A History of Women Philosophers Volumes 1 and 2, as well as several published articles about women philosophers. She joined SSWP at the Philosopher-Queen level in order to obtain Busted!! A Pictorial History of Women Philosophers Volume 1 and is eagerly awaiting the second DVD. Nancy is interested in knowing how our work has impacted academia and courses in philosophy, and whether works by women philosophers have been integrated into philosophy programs. The Senior Learning Program asked her to present information on the subject of women’s contributions throughout the history of philosophy. She presented a brief overview to a meeting of the teachers in this program and reports that the interest and response was very positive. On Wednesday October 14, 2015 Ms. Tomaselli presented Busted!! DVD Volume 1 to a group of senior citizens at the Senior Learning center in Ocala. She reports that it was received with tremendous interest. When Nancy was setting up the session, more people wanted to register than she had anticipated, so the Director of the Senior Learning Program asked her to repeat the presentation. The second presentation of DVD 1, part 1 Ancient Women Philosophers, will take place in January, with part 2 Women Philosophers of the Middle Ages and Early Renaissance being presented in February. Due to the enormous interest, the program has requested that Ms. Tomaselli present DVD Volume 2 Early Modern Women Philosophers in March. Nancy also attends the Socrates Cafe where she raised a question about women philosophers for possible discussion and several in the group loudly responded that there are no women philosophers. 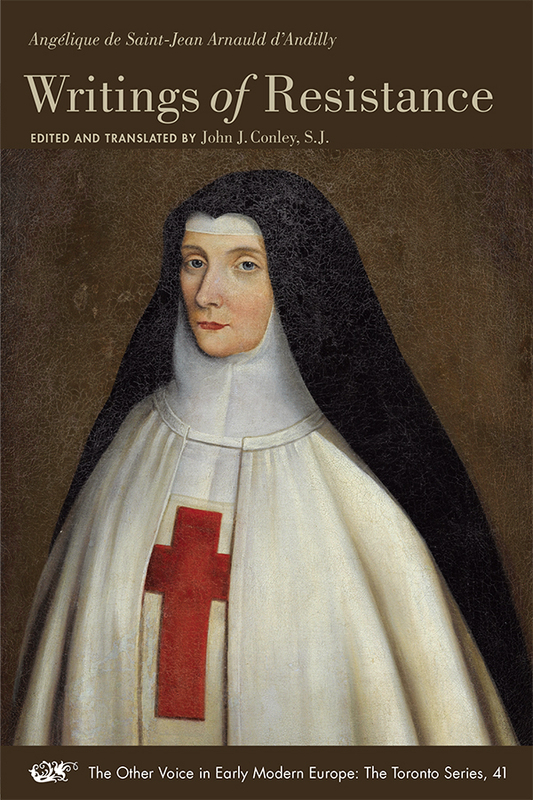 SSWP member John Conley, SJ has published another book about a woman philosopher of the Arnauld family. His first, Adoration and Annihilation: the Convent Philosophy of Port-Royal (2009) introduced us to three previously unknown women relatives of the influential French philosopher Antoine Arnauld. In this work, Angelique de Saint-Jean Arnaud d'Andilly, Writings of Resistance, Conley lets Angelique's own writings tell the story of women religious' resistance to civil and ecclesiastical authorities' demands to conform to their rule. In June, 2015, SSWP member Therese Boos Dykeman conducted a workshop for the National Coalition of Independent Scholars (NCIS) meeting at Yale University. She reports that "it was wonderful seeing so many women involved in really important scholarly work. Like the 19th century meetings in the Midwest where women and men read Aristotle and Plato in the original Greek, small groups or maybe even of a couple of women continue to come together from all across the US to work with profound ideas." Her workshop, (jointly facilitated by another Independent Scholar) "How To Transform Research Into Reality: Writing For Your Venue And Audience" helped other scholars explore the best ways of transforming research into an interesting oral presentation (including the use of images and quotes). Then, attendees learned about the aspects of style, register and target audience which come into play when transforming an oral presentation into a publishable article. As announced in 2014, Mary Ellen Waithe and Dorothy Rogers received a grant from the Americaan Philosophical Association to help with the production costs associated with the production of the Busted!! DVD series. As a part of the grant requirements we were to write an article about the project. We are pleased that our article: "Busted!! A Pictorial History of Women Philosophers DVD series: Pedagogical Tool to Improve Inclusiveness and Diversity?" Will appear in the APA Newsletter on Feminism and Philosophy, forthcoming, Spring, 2016. In this article we discuss the lack of diversity regarding women in the profession of philosophy and suggest reasons why women students do not pursue the profession. We offer SSWP's DVD series as a pedagogical tool that will encourage more women to consider entering the profession while enlightening [clueless] professors as to earlier women's myriad contributions. Through a series of email exchanges with Mary Ellen Waithe, Emerita member Kate Lindemann has proposed that student and un/underemployed members (AXIOTHEA level) as well as faculty (SOPHIA level or PHILOSOPHER-QUEEN level) be invited to submit an article on a woman philosopher for the Kate's Pages section of the SSWP website. Beginning January 2016, articles that have been peer-reviewed will be designated as such. Eventually, all articles will have undergone rigorous peer review. So we will be gradually transforming those pages from simple informational pages to peer-reviewed articles, creating in effect, an electronic encyclopedia of women in the history of philosophy. For student members: Have your Philosophy faculty advisor or other Philosophy professor agree to allow you to do an Independent Study, Independent Research or similar course OR to do a term paper about a woman philosopher selected from the list below. Have your faculty member contact Mary Ellen Waithe at sswpdues@gmail.com to reserve a philosopher for you. That page will be reserved for you until the end of your term (NO extensions!). Submit to your faculty member a paper in MS Word or Doc that follows the format of articles in Kate's Pages / Women Philosophers. It may have footnotes/endnotes and must include a bibliography of original works by that philosopher and secondary articles/books about her. Have your faculty member comment on and grade your paper as though it were being peer-reviewed. This is a higher standard than an "A" Graduate Student paper is held to, so you may need to make revisions as suggested by your faculty member. Have your faculty member submit the paper to SSWP by emailing it to sswpdues@gmail.com. You will be informed when it has been published to our website, and your faculty member will receive a letter confirming that they have refereed a paper for the Society for the Study of Women Philosophers. For faculty: Email Mary Ellen Waithe at sswpdues@gmail.com to reserve a philosopher for you. That page will be reserved for you for four months. Submit to sswpdues@gmail.com a research paper on that philosopher, following the format of articles in Kate's Pages/Women Philosophers. The paper must be in MSWord or Doc. It may have footnotes/endnotes, and must include a bibliography of original works by that philosopher and secondary articles/books about her. It will be peer-reviewed by a SSWP member who may make suggestions for revising and re-submission. Kate is quite right in noting that we are now in an era where electronic publications --if peer reviewed-- are worth (to a student seeking admission to a graduate program, or to faculty member seeking tenure) every bit as much as a print publication. If you've already published a book or an article or a chapter about one of the above philosophers, won't you please consider writing up a brief article about her for the women philosophers pages? Those pages are such an important resource for undergraduate students. If we hope to integrate the canon of philosophy along lines of gender, we must "grow" the next generation of scholars who have an interest in doing so. That "cultivation" begins with undergraduate students. And it is they who use Kate's Pages. 5. Where in the World are Women Philosophers Publicly Commemorated? In the course of your research have you come across public commemoration of a woman philosopher? Is there a street, a plaque, a statue in a public space where a woman philosopher is commemorated? 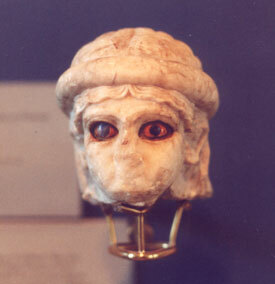 If so, submit a JPEG photo and a caption indicating the name of philosopher and the type of artifact (street sign, statue, etc.) to sswpdues@gmail.com and in the Subject line indicate "Where in the World?" and your submission will appear in a future newsletter. Our last newsletter featured Olympe de Gouges, Mary Astell, Caroline Herschell, Anne Conway, Mary Wollstonecraft, Oliva Sabuco, Simone de Beauvoir and Mechtild of Magdebourg. 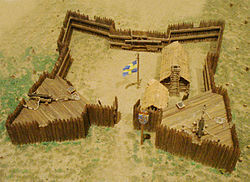 Below, an image of a reconstructed model of Fort Christina, in Fort Christina National Park on the Christina River in Delaware, USA. Oh, you haven't paid your dues? Hmm.. If you haven't paid your 2016 dues, please do so NOW! Click here: Pay Dues. We can't make it any easier. When you pay via PayPal, you can authorize automatic renewal. In that case, your membership will NOT run according to a calendar year (January through December), but from the date of your dues payment until its anniversary. Renew at the Philosopher-Queen or Salon level to receive one of our premiums. Sorry, the popular Busted!! Photo Album is now out of stock. Ah! the cost of procrastination! You've already paid your dues for 2016? Thank You! Visit our "Must Buy" pages and if one of your books (or your chapter in a book) about women in philosophy is not there, email a jpeg of the book cover together with full bibliographic publishing information to sswpdues@gmail.com. in the Subject box write: "Display My Book." If the title of your book is not in English, kindly also provide an English translation of the title.﻿ If you don't provide a jpeg of the cover, Mary Ellen Waithe will no longer go searching for one. Sorry. August: 4395 visits by 1879 unique users from 84 countries. September: 3866 visits by 1782 unique users from 81 countries. October: 4558 visits by 1959 unique visitors from 89 countries. November: 4469 visits by 2000 unique users from 82 countries. December: 4762 visits by 1905 unique visitors through 28 December. Well, we're not quite sure because the web hosting company only lists the top 50 countries from which we've had visitors in any given month, although it does indicate the total number of nations from which we've had viewers. I've discontinued the map, in part because of this, and in part because small nations don't show up well on that map program. Our website is growing and is being viewed by more and more people from more and more countries each year. 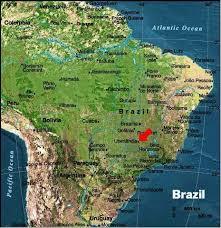 The list at the right shows the country of origin of visitors to our site that we know of. As you see, we are viewed by visitors from North America, South America, Asia, Africa, Australia, Oceana and Europe and are increasing our viewership in the republics of the former Soviet Union, and in the middle east. 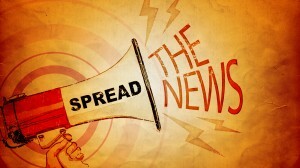 Newsletters are prepared: emails are sent to members soliciting contributions, news, etc., the newsletter itself is composed and created using the webhost's program, another email is sent to members giving the password for accessing the newsletter. Time involved: about 40 hours. Dues are collected by check, credit card, sometimes cash, and via PayPal and banked in a SSWP account. Grants are applied for, projects (the DVDs, articles about them) completed, and reports filed with grantors. US tax returns are completed and filed. Accounts at PayPal, Square and the PNC Bank are monitored, balanced, and income is deposited to the PNC Bank checking account. CFPs are issued, and meetings are scheduled with the APA. Posters advertising the meetings are created and posted at the conference. A FaceBook page (barely maintained, mostly contains posts by non-members but with semi-regular contributions by Ruth Hagengruber, John Conley, Melanie Johnson-Moxley and Mary Ellen Waithe). Thanks to Board Member and co-head honcho John Conley for volunteering to monitor the PayPal account and the PNC bank account. Mary Ellen and John will meet during January to transfer the documentation and access to these accounts. Won't you help with some of these necessary (if unglamourous) tasks? Consider it part of your university-required service to the profession. I've already had to cut back on the frequency of this Newsletter, and have had to totally ignore our FaceBook page in order to manage other necessary tasks.